2nd Edition released August, 2016! Caedmon Bancroft was having a hard time adjusting to life after the accident. What ten-year old boy could glide easily into life without both his parents? The counselors and his new guardians did not know how to solve the problem of this child. But they weren't the ones who were going to change his life. Caedmon did not know how special he was, even among the angelmen. But he was important enough to be pulled from the scene of the accident by someone he never saw, only to be pursued by those he saw all too well. The powers he had were given to no one else. As a result, no one else could be used as the Scout in the battle to come. Malachi Whitman loved no one and nothing, not even himself. he believed he was capable -- leading his newly found people to freedom instead. The Battle of the Angelmen (book 5) the one you've been waiting for! Now they will find out who has been chosen. Will Malachi find it within him to lead this new people to their freedom so he can earn his own? Asher has gone from being a superstar to an unknown. His fame and speed won't get him anywhere now - does he have something else to offer? Caedmon can't fight in a war as a boy, can he? If not, he better overcome his fear to achieve the maturity needed to fight. And can they all stop fighting each other enough to recognize the true enemy? Asher is sure his call to fall in love is with Amity, but she doesn't have the same mission. Malachi is sure Asher isn't focusing on what's important, and he needs the strong warrior's attention. Because heaven knows no one will follow Malachi. Caedmon is sure he brought the battalion to the right place, but did he miss something? Did the enemy track them and already start the attack, or is there another reason no one here can work together to protect the Cause? Who will be the Sacrifice? Who will be the hero? Who will crumble on the battlefield? And who will carry on? The Cause of the Angelmen (Book 6) They must continue. 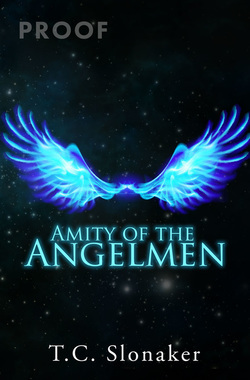 What has happened in the world of humans while the angelmen were fighting their battle? Was anyone held accountable for the disappearance of the young people? Father Mackenzie Abel was the last person seen with Amity David. What happened when he returned without her? And an entire town wants their superstar athlete back. Can the new war veterans assimilate themselves back into the human world? Were they meant to? If not, where do they go? Will they ever be safe? Forces of evil aren't done recruiting this race for their army. The next generation must protect the Cause of the angelmen, with help from a familiar human.